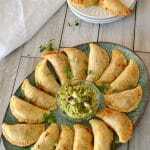 Easy and quick ground meat empanadas. Baked Beef Empanadas, semi-homemade with a juicy filling. Comes together in no time and the first to go in any party. This is how to make empanada filling with a Middle Eastern touch. 3/4 cup chopped green onion from 4 medium ones. 3/4 teaspoon freshly ground black pepper. 1 box refrigerated pie crusts. In a large skillet over medium heat, sauté onion and garlic in oil. Add beef and cook until no longer pink. Add spices, green onion, parsley, cilantro and tomato sauce. Stir to combine and cook for about 5 minutes. On a lightly floured surface, unroll one pie crust. Using a cookie cutter, cut out rounds of the crust. Re-roll dough and cut rounds, you'll be able to get about 12 circles *. Put about 1 Tablespoon of the meat mixture in the center of each circle. Brush the edges of the circle with water then fold over the filling. Seal edges by pressing with a fork. Repeat with the other pie crust. Place on a baking sheet lined with aluminum foil or parchment paper and sprayed with oil. Beat an egg with a dash of ground black pepper.Brush top lightly with the beaten egg. Bake for 11-14 minutes until nicely browned on top. * It depends on the size of the cookie cutter you are using, I've used a Manson jar lid as it was bigger.